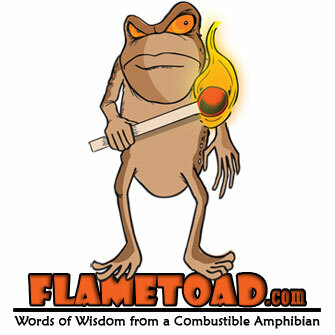 Flametoad » Blog Archive » Curse You, Consumer Options! I just noticed that the entire menu is missing from the Flametoad blog when viewed using IE 6. I could blame my own laziness in not thoroughly testing the design in multiple browsers, but instead I’ll rail against even needing multiple browsers to test against. Wouldn’t it be so much easier to design websites if we only had to worry about one browser? Curse you, consumer options! Anyway, I’ll work on troubleshooting the template in IE, although to be honest I have no idea what’s wrong and my php skilz aren’t what one would call l33t. Maybe my subscription numbers will go up if you could, actually like, you know, subscribe.